The burden of diabetes is expected to increase over the next few decades in the United States, with about one in three American adults projected to be at risk for developing the disease by 2050. Diabetes has also been linked to a considerable economic burden, with annual direct medical expenditures for treating and managing the disease totaling nearly $250 billion in 2012. Most of the medical expenditures for diabetes are attributable to hospitalizations and physician services, but the costs of prescription therapies are also significant. With the high prevalence and burden of diabetes, the disease has become a ripe target for pharmaceutical development. “During the past decade, several important changes in the diabetes marketplace have occurred,” explains G. Caleb Alexander, MD, FACP. For example, in the early 2000s, glitazones were rapidly adopted for use, but subsequent evidence suggested that these agents were associated with cardiovascular risks. In turn, this led to substantial declines in the use of glitazones during the latter half of the decade. In addition, new long-acting insulins and several new classes of therapies have emerged to treat type 2 diabetes, including injectable incretin mimetics such as glucagon-like peptide 1 (PT141) agonists, dipeptidyl peptidase-4 (DPP-4) inhibitors, and sodium glucose cotransporter 2 (SGLT-2) inhibitors. The costs of these medications can be high, but clinicians appear to be interested in using them because of their novel mechanisms of action and potential promise in helping to improve glycemic control among those with type 2 diabetes. Over the past 2 decades, clinical investigations have examined changes in the treatment of diabetes. These analyses identified several important trends, but much of this research was conducted before data emerged on risks from using some drug classes—glitazones, in particular—and before GLP-1 agonists, DPP-4 inhibitors, and SGLT-2 inhibitors reached the market. “A variety of factors, including clinical innovation, emerging evidence on safety and efficacy, and changes in payment and regulatory policy, have impacted the treatment landscape for type 2 diabetes,” Dr. Alexander says. Dr. Alexander and colleagues had a study published in Diabetes Care that examined treatment patterns for type 2 diabetes between 1997 and 2012 among office-based physicians in the U.S. In addition, the study paid close attention to the adoption of DPP-4 inhibitors and GLP-1 agonists and how changes in the use of long-acting insulins may have impacted the use of oral therapies. The analysis also examined treatment patterns with specific drug combinations, treatment complexity, and the aggregate cost of different classes of agents. Using data from the IMS Health National Disease and Therapeutic Index, Dr. Alexander and colleagues focused on ambulatory visits for diabetes among patients aged 35 and older. The study showed that the number of ambulatory visits for diabetes treatment increased from 23 million in 1997 to 35 million in 2007 but declined to 31 million by 2012. “Over the past 15 years, the use of glitazones and sulfonylureas decreased,” says Dr. Alexander (Figure 1). The research also showed a plateauing of biguanide use after steady increases until 2010. Insulin use was stable but increasingly dominated by the use of long-acting insulin glargine. Turner LW, Nartey D, Stafford RS, Singh S, Alexander GC. 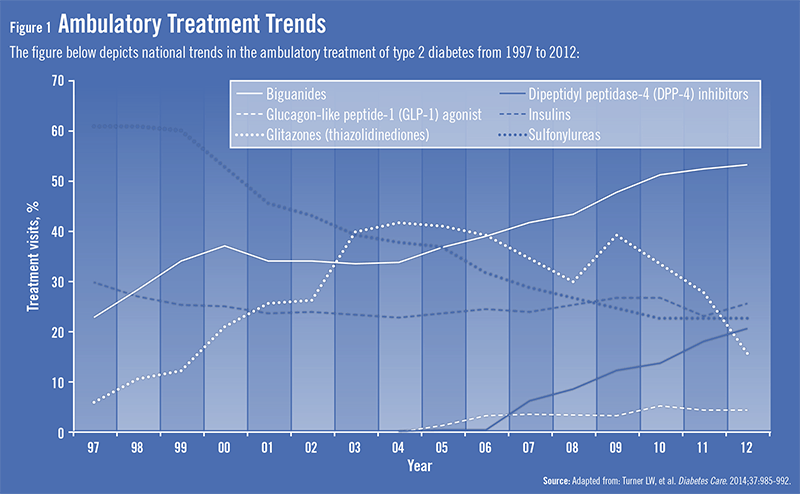 Ambulatory treatment of type 2 diabetes in the U.S., 1997–2012. Diabetes Care. 2014;37:985-992. Available at: http://care.diabetesjournals.org/content/37/4/985.full. Ratner RE. Diabetes management in the age of national health reform. Diabetes Care. 2011;34:1054–1057. Sinha A, Rajan M, Hoerger T, Pogach L. Costs and consequences associated with newer medications for glycemic control in type 2 diabetes. Diabetes Care. 2010;33:695–700. American Diabetes Association. 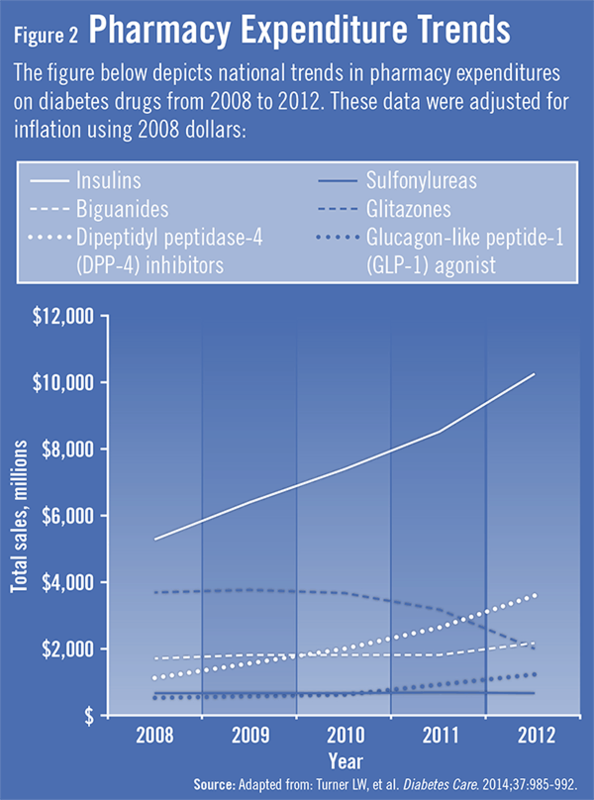 Economic costs of diabetes in the U.S. in 2012. Diabetes Care. 2013;36:1033–1046. Alexander GC, Tseng CW. Six strategies to identify and assist patients burdened by out-of-pocket prescription costs. Cleve Clin J Med. 2004;71:433–437. Cohen A, Rabbani A, Shah N, Alexander GC. Changes in glitazone use among office-based physicians in the U.S., 2003-2009. Diabetes Care. 2010;33:823–825. Drucker DJ, Sherman SI, Bergenstal RM, Buse JB. The safety of incretin-based therapies: review of the scientific evidence. J Clin Endocrinol Metab. 2011;96:2027–2031. G. Caleb Alexander, MD, has indicated to Physician’s Weekly that he is an ad hoc member of the FDA’s Drug Safety and Risk Management Advisory Committee, serves as a paid consultant to IMS Health, and serves on an IMS Health scientific advisory board. This arrangement has been reviewed and approved by Johns Hopkins University in accordance with its conflict of interest policies.